Suffer from allergies? Do you often have to sneeze? Swollen nose? Difficulties breathing? If this allergen enters your body or if you come into contact with the allergen, the immune system responds, leading you to have an allergic reaction. For example, your eyes may swell when pollen enters your eyes, or your ears may swell when you wear earrings with nickel. Comorbidity of allergens? Simultaneous occurrence of allergens? There is such a thing as cross reactivity, in which the body finds it difficult to differentiate between different substances, namely allergens. That is why it may be so that you also have an allergic reaction to nuts, for example, while you in reality are allergic to something else. Furthermore, your immune system weakens when you suffer from an allergy, leading to its functioning differently than it normally would. There are different ways in which one can respond to an allergy. This can differ from person to person. One person with hay fever will, for example, respond by having a running nose, while someone else will experience swelling of the eyes. If you encounter an allergen for the first time, your body will not produce an allergic response right away. However, it will start to produce antibodies. Even a baby which is still in the womb can come into contact with allergens, leading to the production of antibodies. Only after we have come into contact with the allergens several times, an allergic response occurs. This is caused by the antibodies which were produced at the first encounter. They will make it so that your body has a more exaggerated response to the allergen. It seems like allergies occur more and more worldwide. This is, in fact, the case. Furthermore, allergies cause worldwide health issues. Especially in children, a major influence of allergies is noticeable. It can affect functioning to such an extent that daily tasks become difficult to perform. On top of this, the quality of life deteriorates to a large extent when you constantly suffer from allergies. Sleeping, eating or studying/working can sometimes become very difficult if you have an allergy. This can have severe consequences, such as anxiety, stress, and depression, or even stomach complaints. As certain symptoms of allergies occur more frequently, the body part which is most affected by these symptoms, can become imbalanced. On top of the different allergens, there also are different types of allergies. As mentioned earlier, people who suffer from the same kind of allergies, can respond differently to the allergy. Below we therefore discuss the most common types of allergies and the most common allergic reaction to each of these allergies. Different types of treatment against hay fever and other types of allergies have already been developed. There are certain types of medication available, for example, which can be taken in order to suppress to symptoms of hay fever. Except for this medication, there also is another way of treating your symptoms of hay fever. One such option is the online program by “15Minutes4Me.com”, which helps you to improve your immune system and to minimize psychological causes of hay fever. The allergic reaction to house mites is caused by the excreta of the house mite. These animals are miniscule creatures, which can hardly be seen with the bare eye. They are white and are arachnids. Other than an allergic reaction to their excreta, house mites are not harmful. House mites like damp and dark places of 25 degrees in temperature. Their food consists of skin flakes, which is the reason they prefer to reside in beds. If you suffer from animal allergies, chances are that you are allergic to more than one animal. This is because all types of animal allergies are caused by the skin flakes and feathers of these animals. Urine and saliva of animals can also lead to an allergic reaction. The most frequent animal allergies are those of dogs and cats. Allergies of hamsters and rabbits are also very common. If you suffer from animal allergies, the allergic reaction usually takes place about 30 minutes after you have come into contact with the animal. You can experience an allergic reaction when an insect, such as a wasp, injects poison into your body, after you have been stung. Usually this causes a small red bump, which can start to itch. It usually disappears again after a few days. If you are allergic to insect poison, you are likely not to have had a severe reaction the first time you were stung, but the time after can cause life-threatening symptoms. Usually, these previous symptoms occur about fifteen minutes after having been stung. For some people, these symptoms could manifest after an hour instead. Asthma occurs very frequently together with allergies. Both namely affect the airways. If you suffer from asthma, you have difficulties breathing. Furthermore, people who suffer from asthma often have a wheezing breath and coughing issues. Furthermore, asthma often causes a feeling of suffocation, because not enough fresh air is able to enter the lungs. Sometimes, asthma symptoms can suddenly appear or suddenly go away. Especially in puberty, asthma can suddenly get worse or disappear completely. This does not mean, however, that the asthma will never return. What are causes of allergies? There is no general cause for allergies. Causes of allergies can differ from person to person. Furthermore, it also is so that several causes together might cause the development of allergies. Genetics, hygiene and your lifestyle have an influence on the development and presence of allergies. While these factors are known, we do not yet exactly know how and when they play a role in the development of allergies. Genetics play a large role in the development of allergies. If a family member suffers from a certain allergy, chances are that you will also suffer from this specific allergy. Furthermore, you can also start to suffer from an allergy as a baby. This chance increases with the amount of family members who also suffer from this allergy. Allergies occur more and more commonly in the western world because we have become more hygienic. When you are a baby, your immune system is blank. This immune system builds up over the years because it gets into contact with bacteria et cetera throughout the years. If a child never comes into contact with a certain substance, as we have become more hygienic, chances are reduced that this child will be able to defend itself from this substance. How do I treat allergies? It is useful to find a treatment for allergies, as an allergy can largely affect your daily life. For example, asthma can be the consequence of a long-term issue with breathing, caused by allergies. If an allergy is only present during summer months, chances are reduced that the allergy causes damage as compared to allergies which are present all year round. Despite this fact, an allergy which only occurs during certain periods, can still have a severe influence. Do defend yourself against allergies, there are many different medications which doctors can prescribe. For example, eye drops can help people who suffer from swollen eyes. There is medication which suppresses the secretion of histamine. Histamine is secreted by our body after it has come into contact with the allergens, and largely causes the symptoms of an allergy. Symptomatic medication will thus help you to block this histamine, thereby helping to reduce symptoms. It can also be so that you need to take different types of medication at the same time in order to suppress the symptoms. For this, symptom suppressing medication is usually used which makes it so that you experience fewer complaints for a period of time. However, the symptoms return after you stop taking the medication. 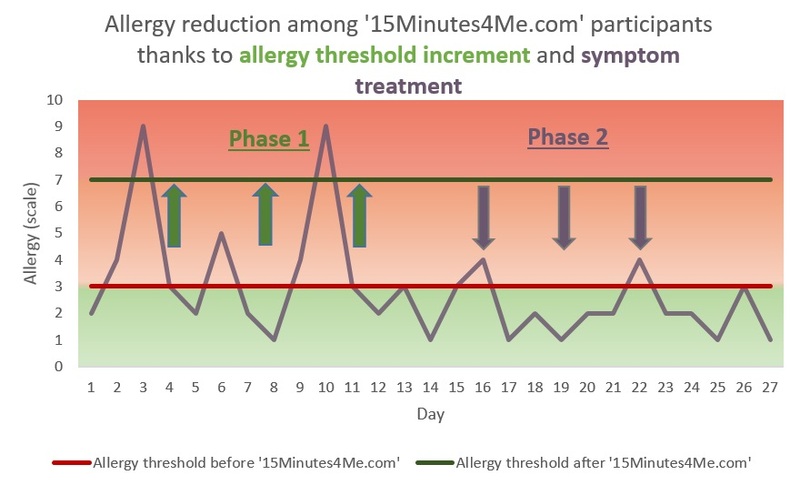 “15Minutes4Me.com” helps you in different ways to work on your allergy threshold. First off, by working on your stress, your allergy threshold shifts. This can lead to decrease of allergy attacks and/or allergy symptoms. Furthermore, “15Minutes4Me.com” can help you to learn to recognize warning signals which come before the allergy attack. This way, you can avoid allergy symptoms. This will also help you in minimizing the number of allergy attacks, the frequency and the duration of you allergy symptoms/attacks. By working on all of these different aspects, you can also work on relapse prevention. This will guide you in a more aware life, in which you recognize warning signals early on and are able to minimize allergy symptoms/attacks. “15Minutes4Me.com” is a scientifically supported program which guides you from home on a daily basis in order to help you to work on the criteria above. Would you like to know what possible causes for your personal allergy there might be? Then take the free allergy test here!